With is winding streets and grand landmarks, there’s no question about it: Rome is a must-see. 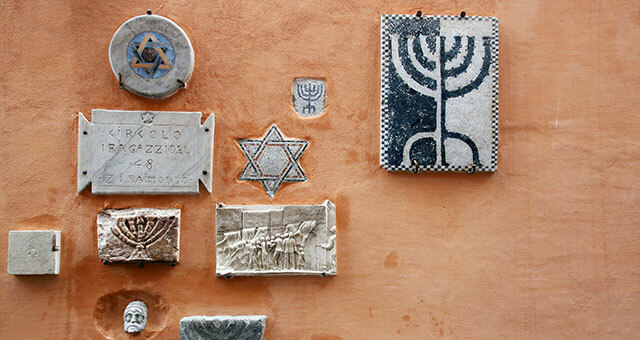 If you ask us, the best way to explore the city is piano, piano—slowly, slowly—and a perfect place to start is the Jewish Quarter, formally known as Sant’Angelo. This ancient neighborhood established in 1555 is replete with history and personality, and is a relatively peaceful escape from the bustle of the city. Here’s how to dive into this small corner of the Italian capital while living like a local and enjoying free time in Rome. All great discoveries have to begin somewhere, and if you need a little city orientation to pinpoint the Jewish Quarter, the Pantheon is a great starting point. This bucket-list monument is located in the Centro Storico and is an 8-minute walk to Palazzo Mattei di Giove. 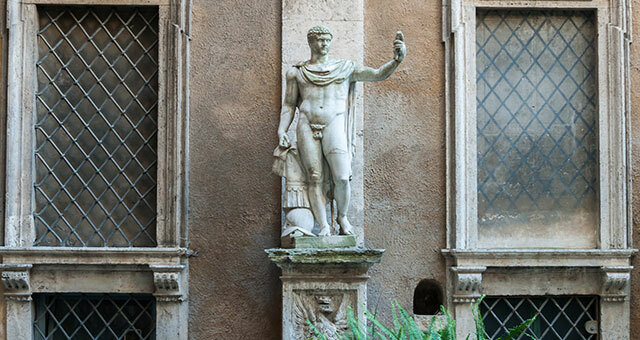 The palazzo, or palace, was completed in the early 17th century and is full of breathtaking paintings and frescoes—even the busts and statues in the courtyard are a sight to behold. 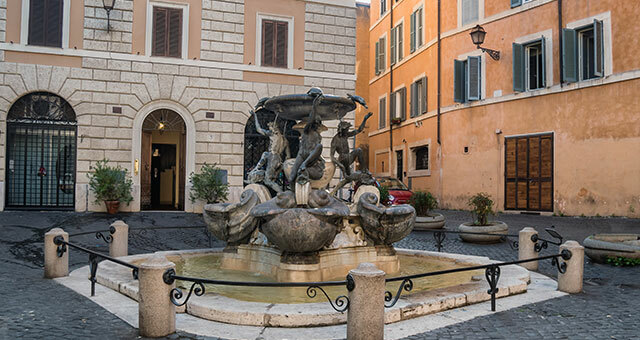 From Palazzo Mattei, it’s only a 1-minute walk to one of the Jewish Quarter’s most famous landmarks: Turtle Fountain. This Renaissance-era structure was used as a drinking fountain by early Romans, and was adorned with dolphins instead of turtles until it was restored in the 17th century. Have a sweet tooth? Be sure not to miss Pasticceria il Boccione, a kosher bakery that’s only a 2-minute walk from the Turtle Fountain. 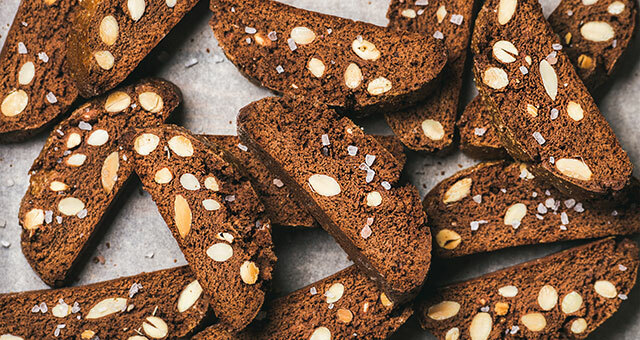 The same family has been churning out the best-of-the-best here for almost two hundred years, but it’s not a flashy sign that will lead you to this small establishment—it’s the delicious smell and the line of people waiting to pick up treats. If you want to snag a slice of crostata di ricotta (ricotta cake) or sweet pizza ebraica (Jewish pizza), we recommend getting there early before the day’s goodies run out. If anything impresses as much as the Jewish Quarter’s staggering history, it’s the neighborhood’s knockout cuisine. One signature dish worth writing home about? 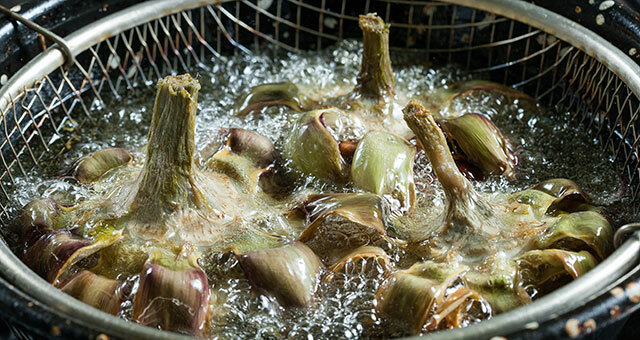 Carciofi alla giudia, or Roman-Jewish fried artichokes. This crispy bite is one of the quarter’s most famous specialties, and you can try a plate for just five euro up the street at Nonna Betta. The second century BC brought with it the construction of the Portico of Octavia, which remains as a standing ruin just a 1-minute walk from Nonna Betta. 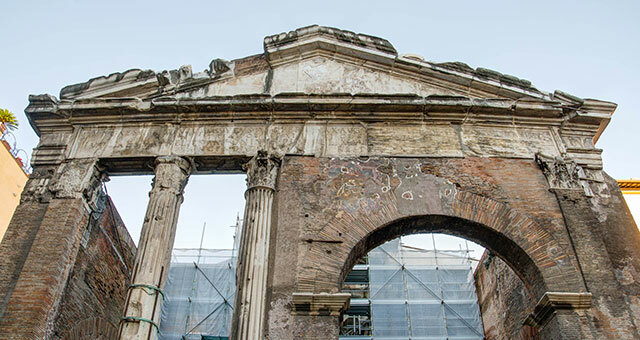 This ancient structure built by Emperor Augustus was once the site of Rome’s fish market, and serves as a reminder of the Jewish Quarter’s extensive past. If you choose to stroll by, you’ll be in luck; the scaffolding that surrounded the monument during a fourteen-year restoration was just removed in December of 2017. 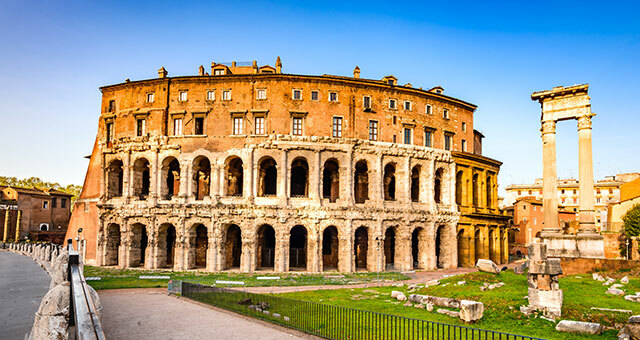 At first glance, Teatro di Marcello may look strikingly familiar to another famed structure in Rome: the Colosseum. You’re not wrong, because this 11th-century amphitheater started by Julius Caesar is the oldest in the city, and was used as the model for its bigger counterpart. The theater is now home to a set of luxury apartments, so while you can’t actually step inside, a stroll around the outside is an ideal way to soak in history. Known as the Tempio Maggiore di Roma to Italians, this grand synagogue is one of the most important landmarks in the Jewish Quarter. It was built after Italy unified in 1870 and Jews were granted citizenship, and the architecture of the building signs an ode to this momentous moment in the neighborhood’s history. The Art-Deco-style of the building and square, aluminum dome not only distinguish it from other Roman landmarks, but serve as a representation of the Jewish community’s liberation. 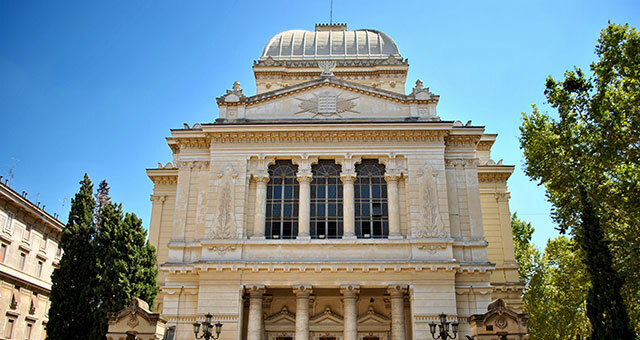 Pay a visit to admire the architecture, or explore the Jewish Museum that’s housed inside. After wrapping up your adventure in the Jewish Quarter, you can enjoy even more moments of discovery in another historic section of the city! Just a 2-minute walk from the Great Synagogue is Ponte Fabricio, Rome’s oldest bridge. 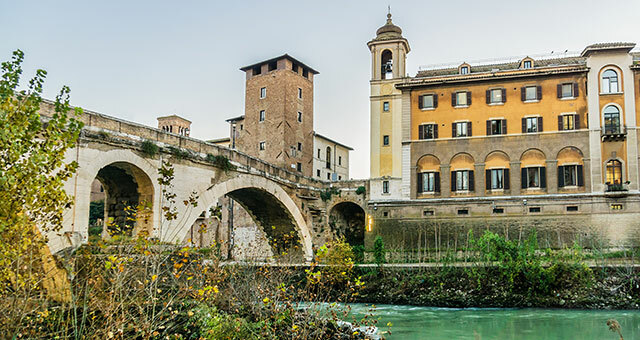 It will take you across the Tiber to the ancient island called Isola Tiberina, which connects the Jewish Quarter with another can’t-miss neighborhood: Trastevere. Have you visited Rome? What’s one of the most interesting neighborhoods you’ve explored in your travels? Tell us in the comments below!